I discovered this fascinating and rare journal of the life of Private James Smithies by accident, having stumbled over the transcript by Jhone Partington and her drive to gain further information regarding the life of her great-great-great-grandfather. Learning that his story had been published by his local newspaper as a serial following his tragic death, I contacted Jhone who kindly agreed to my publishing his story. 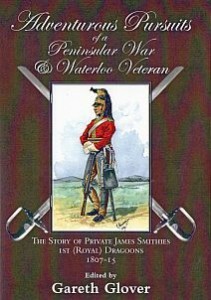 Memoirs by dragoons who fought in the Peninsular war are quite rare, which makes Smithies account even more important. However, a word of caution must also be made. James Smithies apparently recounted his story shortly before his death, some fifty three years after the last events he describes had occurred and therefore, not surprisingly, he occasionally errs in his memory. Public demand for memoirs of the Great War as the war against Napoleon was known until the First World War took on that epithet was avid and a number had been published by the time of Smithies death. Three major histories of the wars had also been published. Sir Charles Napiers History of the Peninsular War was completed in 1840; and Sir Archibald Alisons History of Europe from the Commencement of the French Revolution completed in 1860 and William Sibornes The Waterloo Campaign 1815 and were thus available to interested parties. It is clear that Smithies knew and had access to at least Napier’s and Alison’s works; and there is at times clear evidence that he has utilised them to bolster his own knowledge. Some passages are clearly taken directly from these works, in other sections casualty figures and dates have clearly been utilised from these and Wellingtons own published dispatches. Smithies had probably like many an old soldier of all ages also learnt that a good yarn at the local public house would earn him a few free drinks from his eager audience. In such situations, the story grows with the telling, and actions at which his regiment could not have fought at are added to his tale; and general stories which passed around the army and were mentioned in numerous memoirs in some guise or another, were also claimed as his own. His story must therefore rightly be treated with some caution and stories of the Battle of Salamanca, siege of San Sebastian and Battles of the Nivelle and Orthes can be dismissed as tall tales as he could not possibly have been there. However, it is unfair to even start to think of James Smithies account as being historically worthless, even with all these faults. Because underneath all the flimflam and tall tales, there is for those who bother to look properly, a thick vein of an honest account woven through his story and much that rings very true. For Smithies did not pull his punches and is at times brutally honest about some unsavoury incidents that he was either a participant or an eye-witness to much which must have both shocked and titillated his Victorian audience. It is the only account I can recall where a soldier and his colleagues, who could not perform a mercy killing by cutting the throat of a fatally wounded friend; describe rolling him into a ditch and hastily burying him alive without any finer feeling. He was simply doing what his friend had wanted! His description of cavalry actions are not filled with heroics, but more the truth of confusion, lucky escapes and great relief to simply survive intact. And Waterloo, his last battle, is seen almost only through his own personal journey; his fear at encountering the cuirassiers and his tactic of riding close to them to prevent them having the room to make their deathly stab; his wounding and capture; his numerous brushes with death whilst being driven to the rear and eventual escape speak all too honestly of personal experience to have been added to although his encounter with Napoleon himself is not likely but it could simply be that he honestly thought that it was Napoleon. Overall, Smithies gives a clear insight into the life of a cavalry man – and his mind set amongst the interminable patrolling and very occasional fighting which the life of a soldier has always been during Wellington’s wars. It is very fortunate for us all therefore that the old and battered copy of the ‘Adventurous pursuits of a Peninsular War Veteran’ which had lain ignored until the time came to clear the contents and sell the old family home on the death of her remaining parent has now been saved for us by Jhone. James Smithies is undoubtedly an ancestor to be very proud of.